Westmead Hospital department of respiratory clinical nurse consultant celebrates reaches half a century. 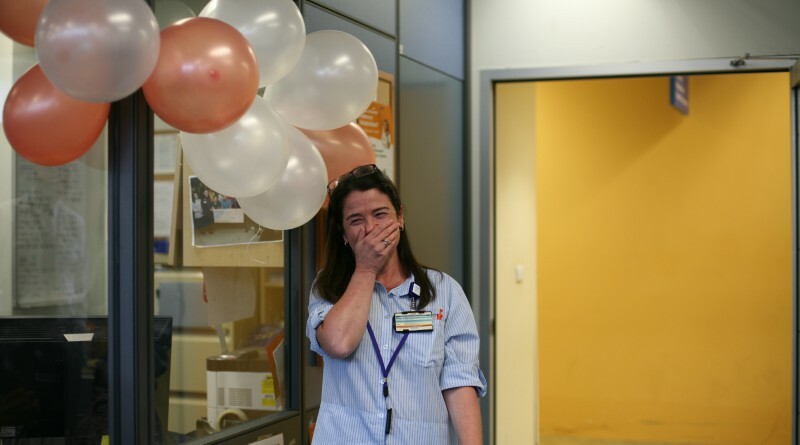 Just as Westmead Hospital celebrated 40 years of care, another special milestone was celebrated at the facility. Mary Roberts, a much-loved clinical nurse consultant, was surprised by her colleagues with a party to celebrate her 50th. Mary started her nursing career as a registered nurse in 1990 and quickly progressed to becoming a clinical nurse specialist followed by a clinical nurse consultant, a role she has continued to occupy to the current day. Several staff attended to wish Mary the best for her 50th birthday. Over the past 18 years Mary has been dedicated to the provision of excellent clinical care for the patients who suffer from chronic respiratory disease. Westmead Hospital respiratory ambulatory care physiotherapist Minh Nguyen said patients, colleagues and peers praise Mary for her dedication, passion and compassionate care. “Nothing is ever too much trouble for Mary and she continues to be a passionate advocate for maintaining and improving the standards of care for patients with chronic respiratory problems, both locally and nationally,” Minh said. Mary has been recognised for her many clinical and research achievements, including numerous project grants, a Judith Meppem Travel Scholarship, the Tracey Robinson Excellence in Teaching Award, a WSLHD International Nurses Day LHD Award, and most recently a finalist in the Judith Meppem Lifetime Achievement Award in Nursing. Not one for being lost for words – Mary Roberts was overwhelmed at the surprise party thrown by the respiratory department. “I had no idea the staff had planned a party for me and I was so touched, overwhelmed and speechless,” Mary said. “So many people took time out of their busy schedules to join in and it was wonderful. Hologram workshop: exciting way to have your say!